December has been an interesting time for trading the spot price silver market which initially suggested a strongly bullish move higher which was promptly reversed by the strongly bearish signal in late November which has since continued to be confirmed. 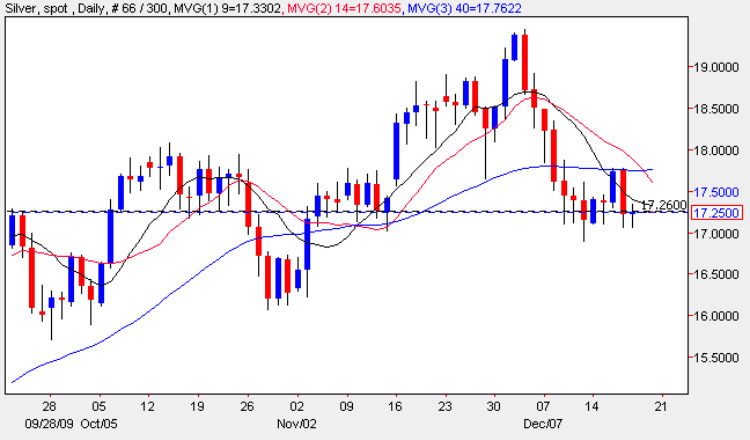 Last week’s price action reinforced this bearish sentiment with both Wednesday and Thursday finding strong resistance from the 40 day moving average, not an encouraging sign for silver bulls, and with Thursday’s wide spread engulfing signal adding further pessimism the picture is looking increasingly negative for silver prices. With the 14 day now crossing below the 40 and with Friday’s high failing to breach the 9 day moving average this again also indicates a degree of bearish sentiment. In addition we are now within the major congestion created earlier in the year between the $16 and $18 per ounce price band, and for any sustained recovery in spot silver we will need to see a break and hold above the $18.25 per ounce price handle initially followed by the $18.70 per ounce price point and ultimately $19.25 top of the recent rally. To the downside the $16 per ounce price level remains key and should this potential platform fail to hold then we could see a re-test to as possibly as low as the $15 per ounce price handle. It is interesting to note that on the monthly silver chart the $19.50 price point has proved a difficult level to overcome in the past and in addition with the failure to breach this level in 2008 we could, potentially, be seeing the early stages of a double top formation on the silver chart. Naturally we must be wary as this potential formation is in its very early stage of development and we must always trade what we see and not what we would like to see.